A train-hopping elderly vagabond (Rutger Hauer) drifts into Hope Town where he panhandles in hopes of fulfilling his dream of buying a used lawn mower. He teams up with a prostitute hoping that their combined entrepreneurial savvy will get them off the streets, but this earnest endeavor is thwarted when some young hoodlums rob the pawn shop that carries the cherished lawn mower. The drifter gets his hands on a weapon and sets his mind on revenge, thus becoming the titular Hobo With A Shotgun. The film starts strong with a fine setup sequence featuring a crowd-gawking decapitation of actor Robb Wells (Trailer Park Boys) at the hands of the villainous The Drake (Brian Downey) and his evil gang. It’s not a wink and a nod, but a punch to the face of the audience that sets the tone for the rest of the film. Fun, violence, and over the top exploitation ridiculousness rule this town. It’s quickly apparent that Hauer’s Hobo is going to have to rack up a high body count to get that lawn mower. Which is a tough thing to say. Director Jason Eisener is a master of the short form presentation having already delivered the perfectly executed and snappily titled Treevenge as well as the fake grindhouse trailer that served as the precursor to Hobo. Both pieces left you satisfied if not wanting slightly more for the sheer grimace they left behind. But in the long form, much that made his short films work has been abandoned. At just under 90 minutes, Hobo is overlong, stretching the brilliant outbursts into exhausting exercises that ultimately fall flat simply because of the filler needed to turn a great short film into a feature. The recent trend of hip, throwback exploitation films has varied in quality and success. Black Dynamite’s success relied on its tone, theme, and premise as a self-aware parody. House of The Devil relied on its exacting tone and structure. As a throwback, Hobo is not quite the parody of the former nor is it a strict homage like the latter. It’s something in between whose parts do not equal something greater nor does the hodgepodge left behind fulfill or achieve anything of a desired worth. I really wanted to love this film. I would love to say I even liked this film. Jason Eisener has the potential to make an excellent feature, but unfortunately his long form debut doesn’t live up to its amazing title as it wallows in its own grinning, self-gratifying mediocrity. 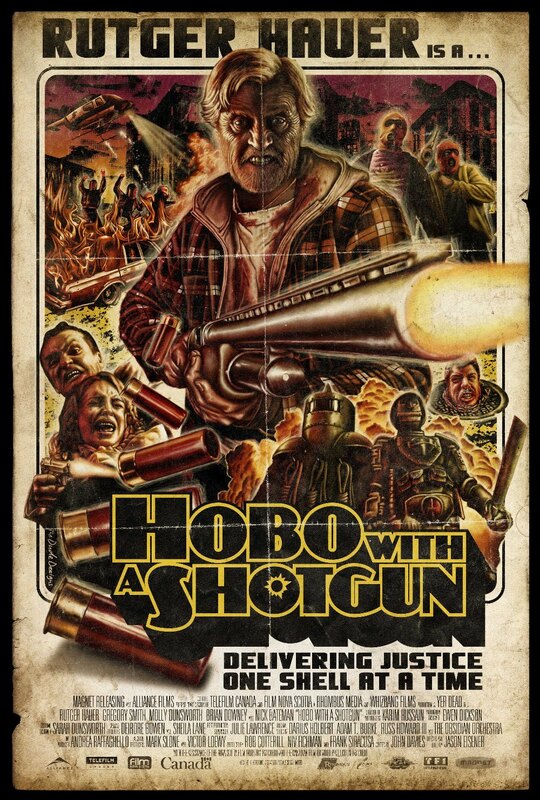 Hobo with a Shotgun opens today at the Ritz at the Bourse. Charles III is a local filmmaker and an ex WKDU program director with extensive knowledge of bad music and worse movies. He has an MFA in film to prove it, so what he says is important and relevant. You wish you were him. Respect is due.